He Shoots, He Scores!!! 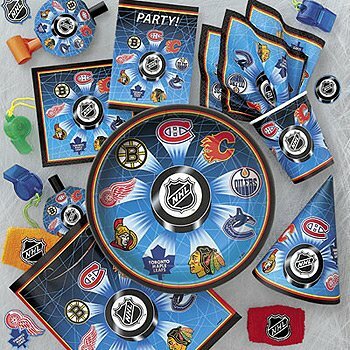 These Hockey Party Ideas will hit the crowd with a game misconduct for having too much fun! With a 2 minute penalty for dancing, an icing call on the cake this party will definitely go into overtime! When guests arrive have different hockey jerseys to wear along with their party hats. Hockey Hall of Fame - Get a life size cut out of your favourite players. These are fantastic for decorations and also for pictures. Print out the photo of the player with the guests and sign them with a black sharpie (forge the players signatures). Stick Painting - Get all the guests their own hockey sticks. You can get some wooden hockey sticks for reasonable prices now. Set up a painting stand with permanent paint. This a fun activity and makes a great party favour. Play Air Hockey - Air hockey is awesome fun for an indoor party. This game is played usually with two players and the 'puck' floats as it slides across the hockey table. Rent the Rink - Go to your local ice rink and it is possible to rent by the hour. Host the party or part of the party as a skating party. Or it is also possible to go to a "free" skate. These are not free for the cost, but mean free choice skating time. Pin the Puck in the Net - Who will be the first to score. Make the pucks different to represent the different hockey teams. Sharpie markers and team stickers work wonders. Who's the Biggest Fan - Face paint, temporary tattoos and nail paint the guests the colours and logo designs of their favourite teams. Shooting Contest - Who can shoot the most amount of pucks into the net in a certain amount of time. Have a kids net and multiple sticks and pucks (or balls). If you wish you could even blind fold the guests (depending on the age). Snow Ball Fight - Kids love a good snowball fight!!! Set out some ground rules at the beginning e.g., no rocks or ice in the snowballs, etc. Safety first. Watch the Big Game - Set up multiple televisions just like at the local bar. Air Hockey Tournament - Get an air hockey table and have a tournament with your guests! This will be really fun! Serve food that you can get at a hockey rink e.g., pogos, pizza, onion rings, French fries, popcorn etc. Keg beer for the older guests - Serve in Hockey Beer glasses. Beer glasses come with all the different hockey logos. Puck Shaped Cake - chocolate cake with black icing (make with chocolate icing). Ice Hockey Rink Cake - use a rectangle shaped cake. Ice the cake with vanilla icing tinted white (Wilton colours) and the pipe in the lines. You can also get the hockey figures to place onto the cake (also made by Wilton). Hockey Logo Cake - This will be different by the different shapes and colours of your favourite team.